A police source says the suspect in an attack on soldiers near Paris is a 37-year-old Algerian man who was legally living in France. 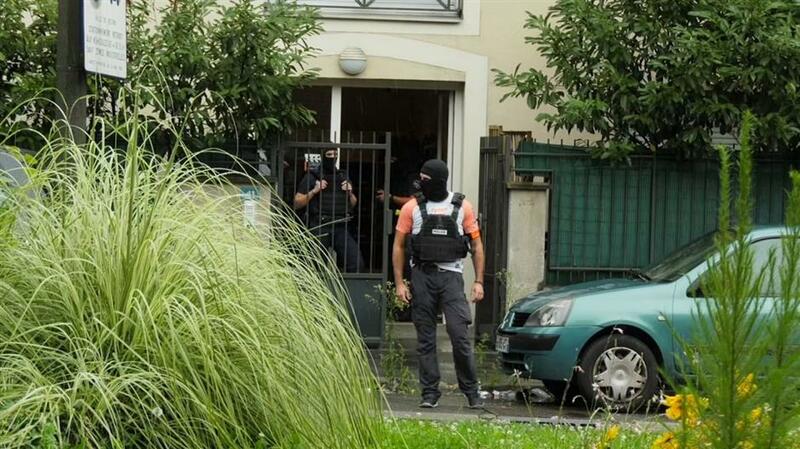 In this image taken from video, masked police stand outside a residence during a search at Sartrouveille suburb, northwest Paris, Wednesday, Aug. 9, 2017. Officials have said that French police are searching a building which is believed to be linked to the chief suspect in a car attack that injured six soldiers in Paris. The man, Hamou Benlatreche, was known to French police over minor crimes but has never been convicted in court, the officer told The Associated Press Thursday. He spoke anonymously because he was not allowed to speak on an ongoing investigation. French media, who reported the same name, say the suspect was living in the suburb of Bezons, north of Paris, where police searched a building on Wednesday night. The suspect rammed his car into a group of soldiers Wednesday, injuring six of them. He was arrested by police following a highway manhunt and was hospitalized with bullet wounds.